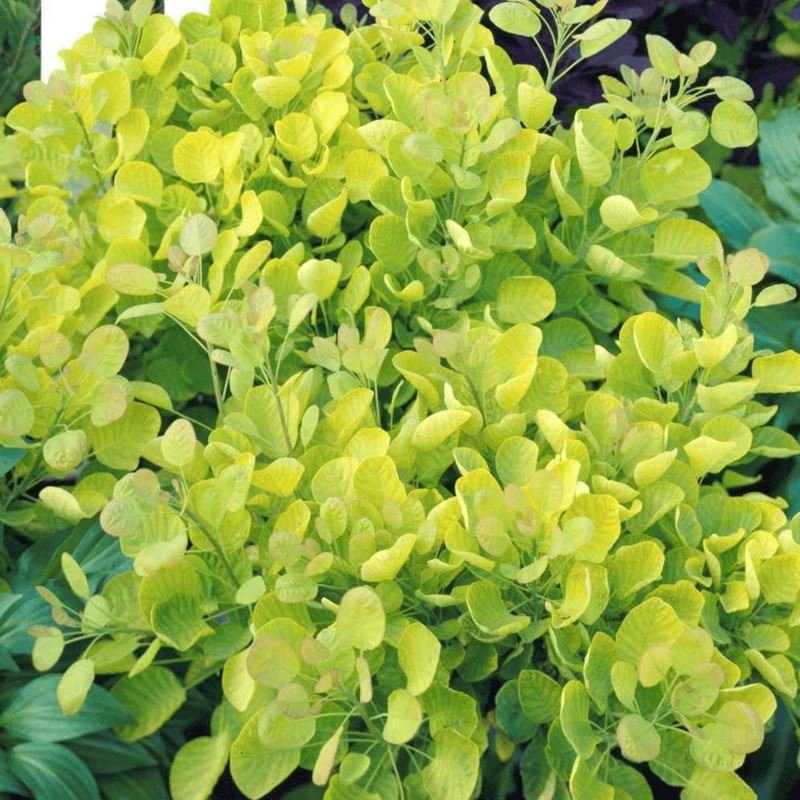 Cotinus Golden Spirit is an amazing plant, with unusual but bright foliage colours that are sure to decorate any garden. Also known as the Smoketree Golden Spirit or simply the Smoke Bush, this is an upright deciduous shrub that can reach a height and spread of 4 metres when allowed to spread. This outstanding perennial provides a unique contrast for other shrubs, with its golden-yellow leaves that develop shades of orange and red in autumn. Smoke Bush produces ovate leaves that retain their bright green colour throughout the summer. In autumn these exquisite leaves will display amber or scarlet tones with hues of gold. In spring, the tiny yellowish flowers of Golden Spirit appearing in terminal panicles are very insignificant, if any. This wonderful plant is all about its foliage colours and the smoke-like hazy effect produced by the hairy leaves. Golden Spirit is an easy to grow shrub that can tolerate most soils. Plant it in average to medium-moisture soil that is well-drained. It prefers full sunlight or partial sun where it can show off its hazy and smoky foliage effects. Provide average to moderate watering and keep the soil moist using a layer of organic mulch until the plant is young. Once established, Smoke Bush will turn drought tolerant and hardy. It will demand low maintenance including annual pruning in winter, to keep its shape and size as desired. This award-winning smoke bush makes a remarkable accent plant. Prune it to use it in large containers on the patio. Golden Spirit Smoke tree is perfect for hedging and screening in sunny gardens, where it can proudly display its glorious golden foliage all summer long.